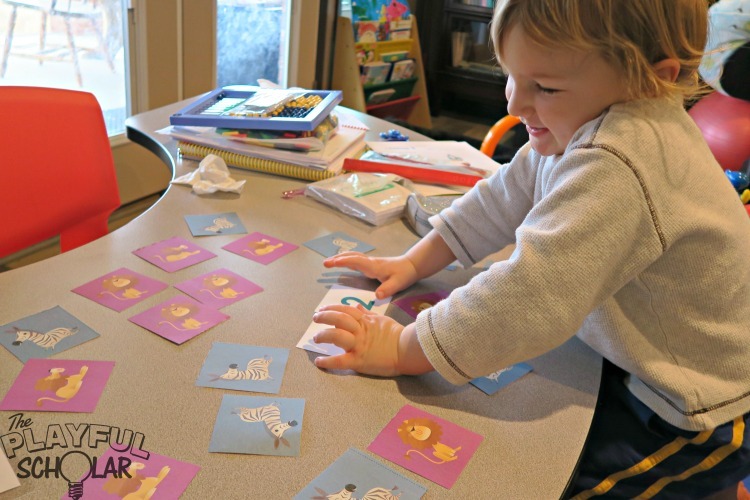 This week we are learning more about “Wild Safari Animals” with our favorite preschool curriculum, Mother Goose Time. A big concept we covered is predator versus prey. “Safari, So Good! : All About African Wildlife” from the Cat in the Hat’s Learning Library is a fantastic introductory book to wildlife in Africa and spurred the interest in pursuing this math game. In this game, lions are predators and zebra are prey. My kids are all about the lions eating the zebras. If you have a more sensitive child you could have zebras eat grass or parrots eat peanuts. How you play will depend on your child’s current skill level with math. We have three variations of this game. Variations one and two are for players learning to recognize their numbers. Variation one is ideal for use with one child. Variation two is easier to use with more than one player. Variation three is best for learners who are ready to practice greater than and less than. Place all cards to show the pictures. You should be looking at zebras and lions (all numbers are hidden). Let the child choose which lion he wants to let eat. Turn that lion card over and read the number. 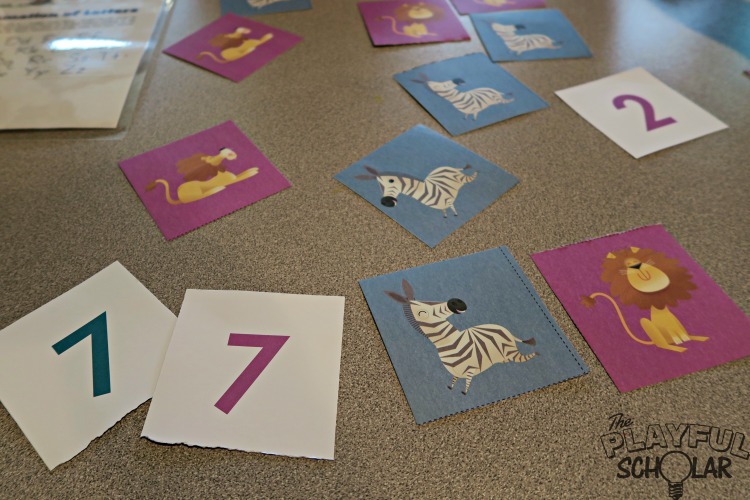 Turn zebra cards over one at a time until you find the zebra card with the matching number. 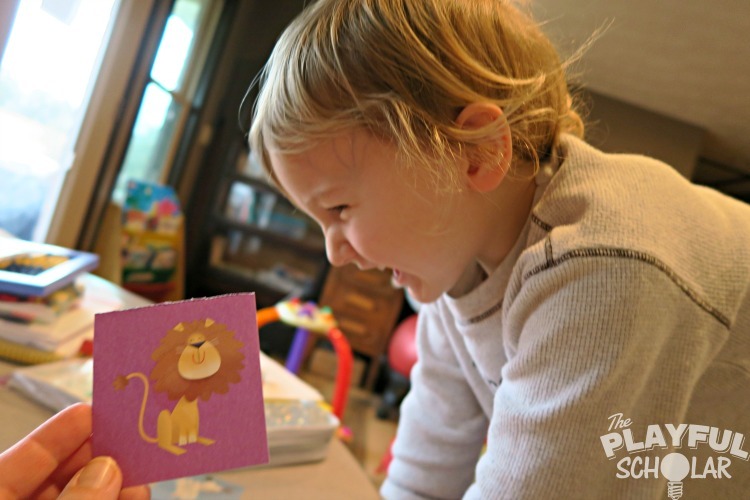 Let your child roar as the lion card eats the zebra card with the matching number. 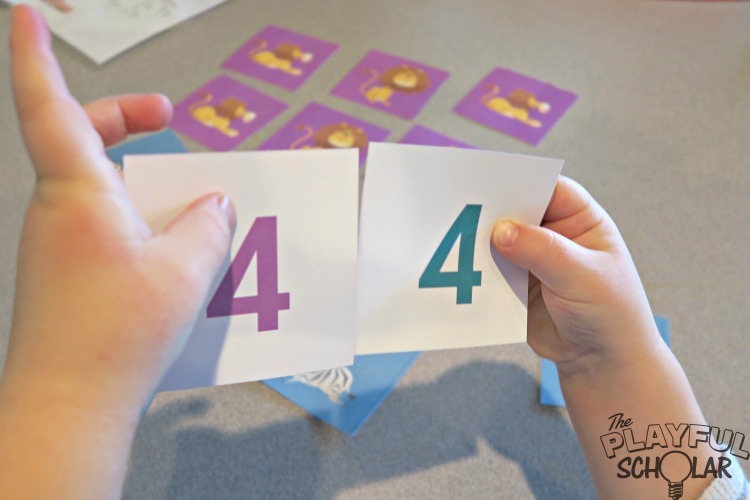 If you have a more mature child needing practice with number recognition, a child that wants you to play too, or multiple kids who want to play at once this version works well. Decide which lion looks the most hungry and turn over that card. Have the players take turns trying to find the matching zebra. The player that finds the zebra card that matches the lion card keeps those cards. A player turns over a lion card. Who looks most hungry? The same player turns over a zebra card. 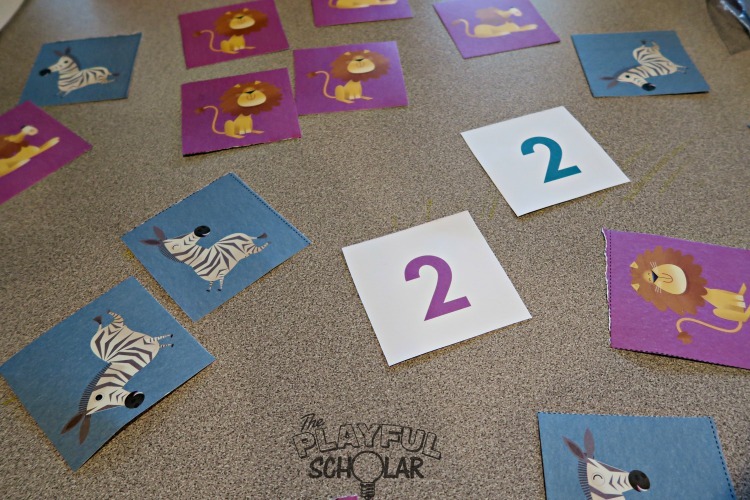 If the zebra card is less than the lion card, the player keeps the pair and the lion gets to eat. If the zebra card is greater than the lion card, the zebra gets away with his life. Play is repeated as the players take turns. I love his scrutinous face! He’s recognizing that the numbers look different depending on their orientation. 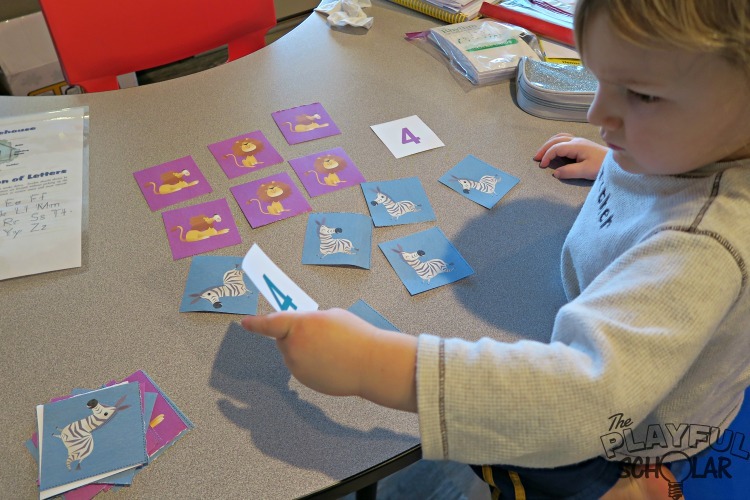 Many kids, mine included, tend to learn numbers well through play. 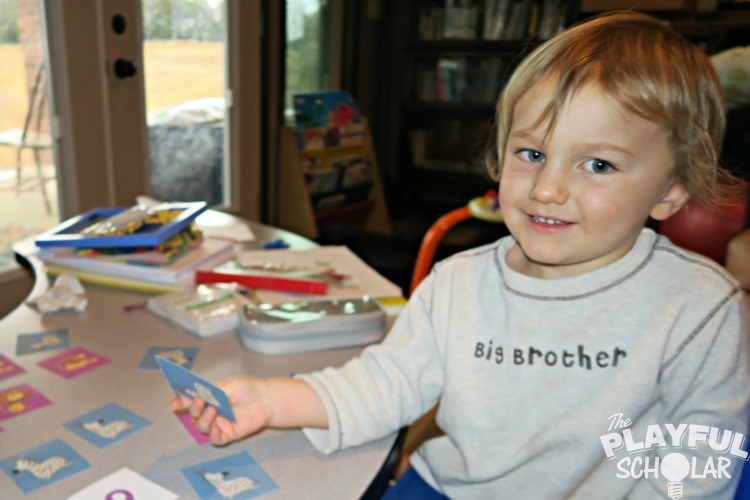 With multiple kids under the age of six, I find it challenging to find time to plan and to gather the materials necessary to play these games with them. I also get frustrated when a nice set of cards gets ruined or expensive games are destroyed through chewing or lost pieces. Mother Goose Time offers me a great solution by delivering literacy, math, and creative art themed materials directly to my door each month. Although we do occasionally save a favorite game or two for reuse (hello laminator), I don’t stress missed or destroyed pieces. I know another collection of age appropriate, fun games is on the way next month. 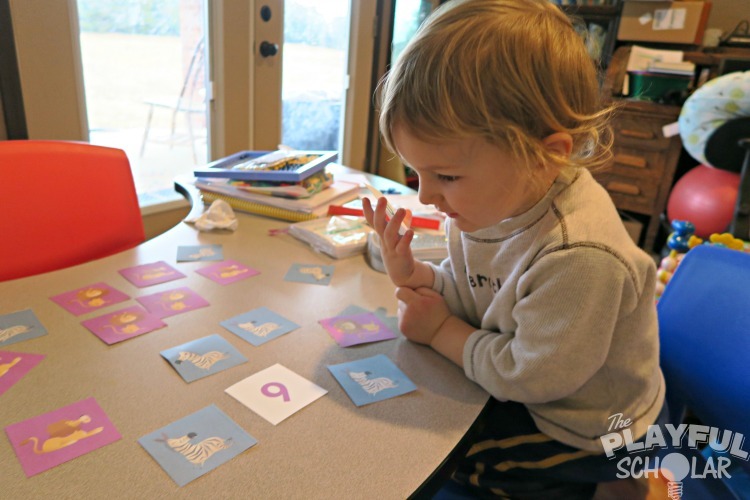 Learning to recognize six versus nine!